This book started as a concept paper on business finance and gradually, the compilation of materials from various authors of other business books and newspaper articles on business and finance, as well as the gathering of comments/suggestions of friends and family, creating it into a study guide for the introduction for business and finance. Fin 21 is a 3 unit course in the College of Business Administration with a description of Introduction to Business and Finance. The syllabus of the course is included in the manuscript. This book serves as a guide for business students, and would be entrepreneurs. The first part of the book is about the external environment of the business in a Philippine setting. It includes the economic system and business environment of the country, legal forms of business and the social infrastructure of business. The second part of the book is about business operations which technically is the internal environment of the business. It includes the different perspective of management, marketing concepts, production, human resources and information systems or the technology business has to deal with presently. The third part of the book is about financing operations. It gives a background about finance particularly on the Philippine financial system and monetary system. It includes the credit management most. Categories: Business, Our Product. 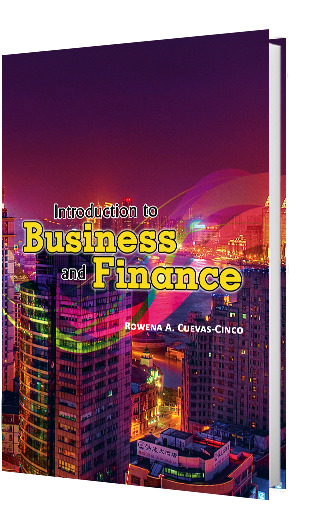 Tags: Business and Finance, Bussiness, College Books, Finance, Rowena A. Cuevas-Cinco. 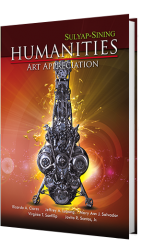 Authors: Ricardo A. Clores, Jeffrey A. Lubang, Mary Ann J. Salvador, Virginia T. Sanfilip, and Jovito R. Santos Jr.
Where do we put the humanities and the arts in a nation that budges and prods its students, like a mantra recited on a daily basis, to take skilled works? Today, the demands of the First World markets are nurses, caregivers and call center agents. Tomorrow, First World needs might shift to hotel and restaurant management practitioners, plumbers, electricians, automechanics and the like. As the country sinks deeper in its economic woes, at the same time tightens its grip even more to First World needs, students are left with no other choice but to submit. Not that there is anything wrong with being a caregiver or a call center agent, if this is what a student truly wants, but the condition paints even more of the pathetic and dwindling opportunities and possibilities for Filipino students. 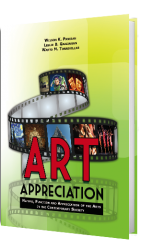 Because Art Appreciation is one of the required general education subjects in he revised General Education Curriculum (GEC) come 2016, we decided to come up with a textbook that would comply with the general education course, This subject would focus on art as art which is primarily aesthetics. Students in Art Appreciation vain be taught how to view a work of art, what to look for and how to tell if an art work is good or bad. While aesthetics is evidently important because art, after all, is primarily aesthetic, the new subject will focus on the reationship of art to the individual student and his/her surroundings_ The course then aims to provide students the opportunity to examine, experience, and even produce works of art in order to appreciate their role and purpose in life. Students will be exposed to various categories of art such as visual arts (from the classical art forms to the modern art installations), the performing arts (music and dance, particularly Modern and Contemporary Ballet), drama and film (from mainstream to indie films), enhanced e-books, and multi-media aesthetics. This subject will thus build upon and hone the skills of urderstanding, critical appreciations and expressions of one's views. At the end of the semester, students should be able to understand and approach a work of art from a perspective informed by history and tradition and the social environment in which the art work is created. Like the other General Education Subjects, this subject is multi-disciplinary wherein students must use tools from various disciplines other than aesthetics to come to terms with the way art influences their personal lives. At the end of each chapter, various creative exercises and activities wit be answered by students to measure their cognitive learning aside from the reaction and critique papers they will submit after watching a ballet presentation, a musical concert, an indie film, or an actual painting demonstration. Research and data collection skills will also be enhanced thru library work and Internet research. individual and group activities will be assigned in class in order to improve communication and teamwork skills thru sharing and group activities. We believe that in this age of information technology, students should be trained and tapped to integrate and utilize machinery and computer software ire creating beautiful artistic works of art. be taught and exposed to. We hope that at the end of each chapter in this textbook, the students would be able to employ the communicating nature of the various media of arts as a catalyst or tool in understanding themselves as individuals and the society in which they live. Since the issuance of Department Order No. 15, s. 1967, “Physical Education and Sports Development Program,” the emphases of the Physical Education program in our country have been on physical fitness, social training, and personal discipline for all pupils and students as well as on the development of potential athletes who are physically gifted and inclined to specialize in athletics. More explicitly stated, “The goal of physical education is to instill in young citizens a proper appreciation of the importance of physical development in individual and social activities (A. Rivera, 1991). This book will better aid the teachers in developing the capabilities among the students. The students are expected to visualize, conceptualize, verbalize, and actualize the field of gymnastics. It is also hoped that they will be able to apply the training principles and methods discussed here beyond their PE classes. After all, physical development is not only an obligation of the State or a concern of the schools and P.E. teachers, but most importantly, a duty of every individual, whether or not taking PE. This book consists of thirteen chapters starting from introduction to physical education with physical fitness and wellness. 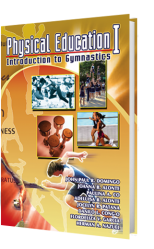 Emphases will be on the six phases of gymnastics. Moreover, cheer dance was included to provide ideas on basic movements, skills, and terminologies. Activity tests are provided at the end of each chapter to mitigate the workload of teachers handling P.E. 1 (Gymnastics). However, teachers are advised to conduct other activities that will address the varying needs of their students and to evaluate students' aptitude and performance using varied forms of instruments for reliability, accuracy, and validity. The authors of this book are indebted to the authors of the various sources cited in this book. They also wish to express their gratitude to Mr. Jerome M. Katipunan of the Mutya Publishing House, Inc. for his trust and confidence in them, and more specially, for the opportunity to contribute, in this humble way that they can, in the effort to better facilitate the teaching-learning process in the tertiary level. Likewise, gratitude is due to all teachers who will find this book useful in their classes, and all PE. 1 students who, hopefully, will appreciate the value of this book in their pursuit for knowledge and skills for a better life that they all deserve.